Together, Paul and I took more than 700 photos during his two-week stay. Here are just a few! Paul arrived on New Year’s Eve, or Silvesterpfad in German. So we celebrated his arrival with a cup of punsch in the First District and a fireworks show over Viennna’s city hall. Our friend Jane taught us to say “Guten Rutsch” (“Good slip into the New Year”) and bought us each a glücksbringer, a small pig figurine that will bring good luck in 2017. We also discovered the uncomfortable Viennese tradition of shooting blanks from real guns into the air all night long. 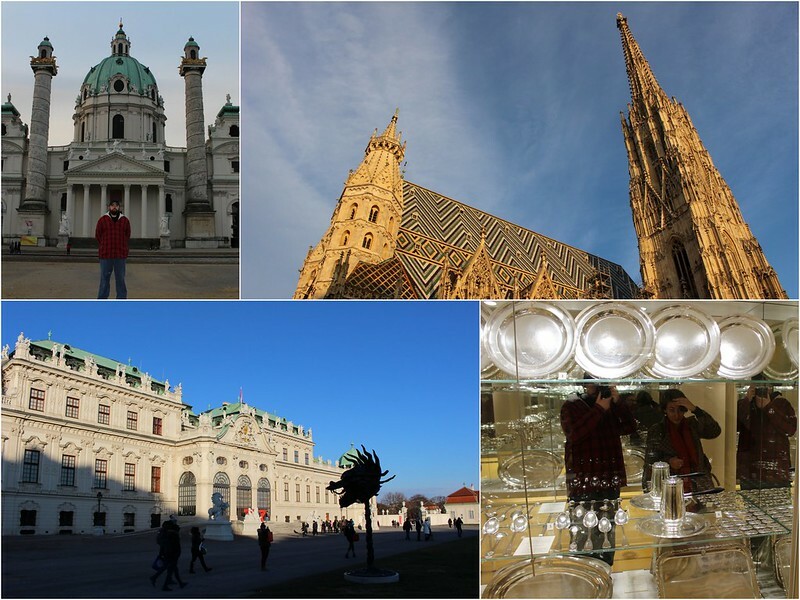 During our first week, we were aggressive about seeing Vienna’s architectural “bigs ones”: the Stephansdom, Karlskirche, Ruprechtskirche, Schloss Belvedere, Schloss Hofburg, Schloss Schonbrunn, and more. My phone pedometer clocked well over 60,000 steps, or THIRTY MILES of sight seeing. We were selective about our formal tours, though, and opted only to go inside the Hofburg, Vienna’s imperial equivalent to the White House. We saw enough silverware and porcelain plate sets to last us both a lifetime, but the historic royal apartments were definitely worth the visit. From top left: Paul at the Karlkirche; one of his shots of the Stephansdom; a dragon statue outside of Schloss Belvedere; the extensive silver collection at the Hofburg. 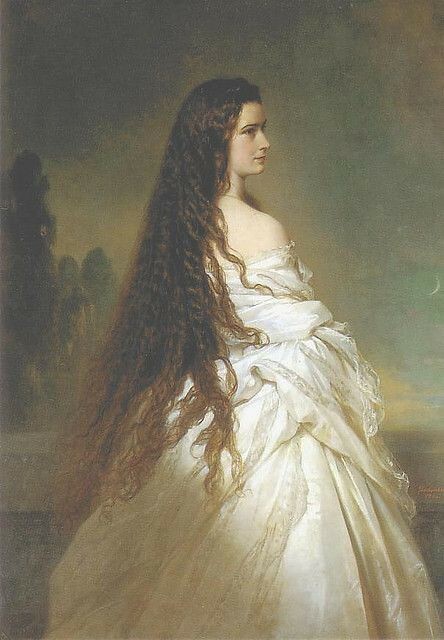 Paul’s preferred portrait of Sisi. Overall, Schloss Schonbrunn was Paul’s favorite imperial building. 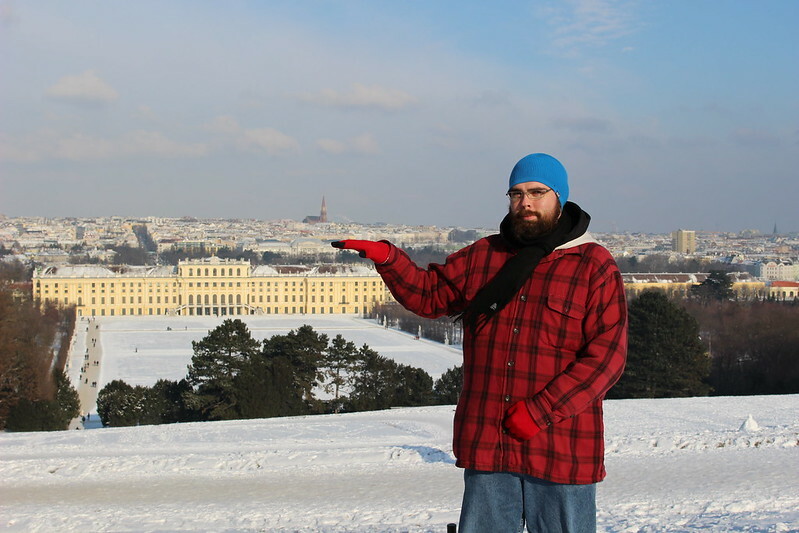 Our first attempt at visiting was thwarted by a “winter storm” that shut down the city’s parks, including Schonbrunn. Vienna isn’t all fussy 19th-century stuff, though. 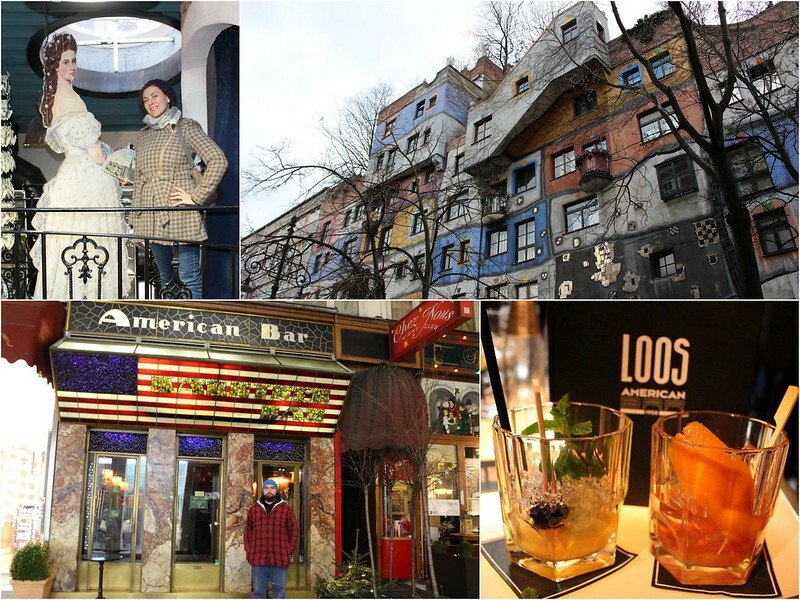 For some modern scenery, we visited the Hundertwasser Haus and Village, along with the Naschmarkt and the Loos American Bar, a tiny saloon designed by one of Vienna’s most famous architects. We met up with Sisi again at the Hundertwasser Village; the facade of the Hundertwasser Haus; Paul in front of the tiny, 290-square-foot Loos American Bar; the bartender’s attempt at an Old Fashioned. Key word: attempt. 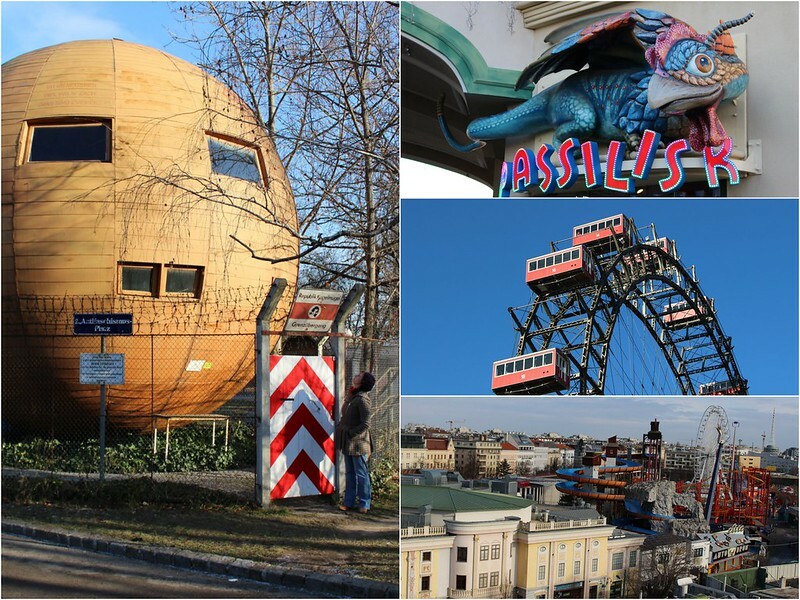 Vienna’s quirky amusement park is one of my favorite places in town. We rode the 100-year-old Ferris wheel and paid a visit to the Republik of Kugelmugel, a spherical micro-nation whose “citizens” declared their independence from Austria in the late 1970s. Paul’s new pet: the “chicken dragon” above a souvenir shop in the Prater. 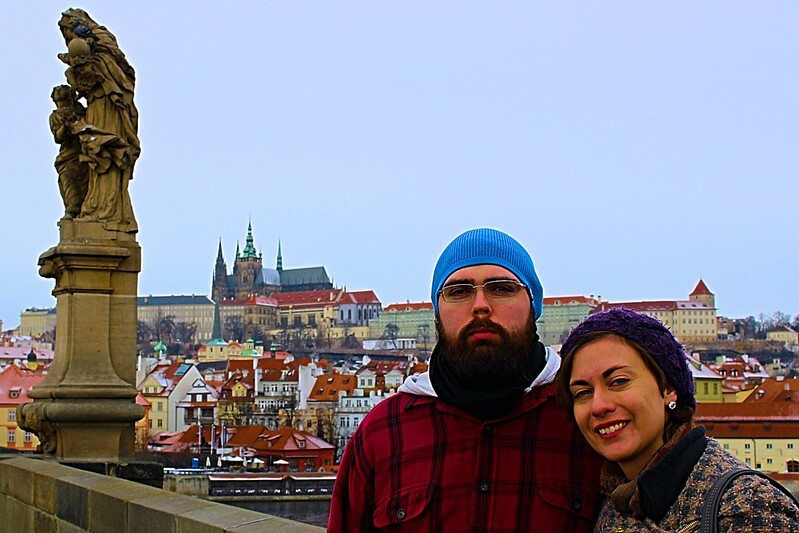 At the end of our busy first week, we took a break from Vienna and headed north to the Czech Republic for more architecture, more hearty fare, and … more walking. 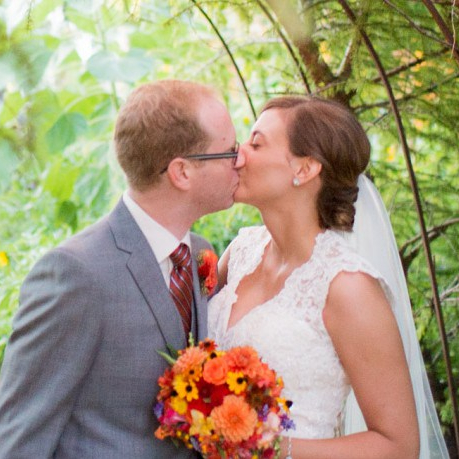 Read more about our weekend there. 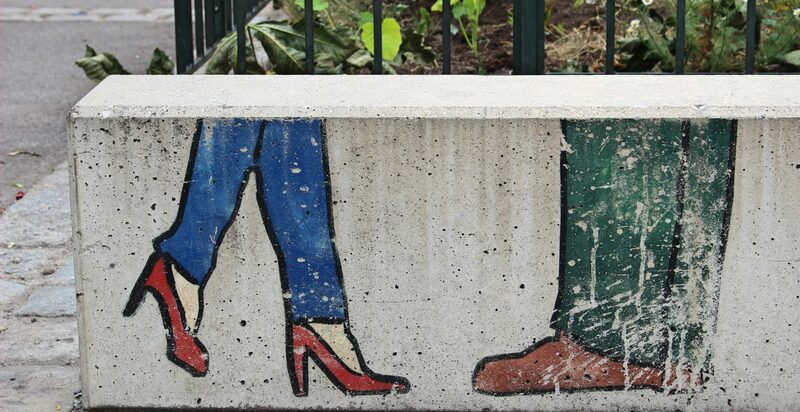 By the second week of Paul’s visit, our feet were pleading for a break. 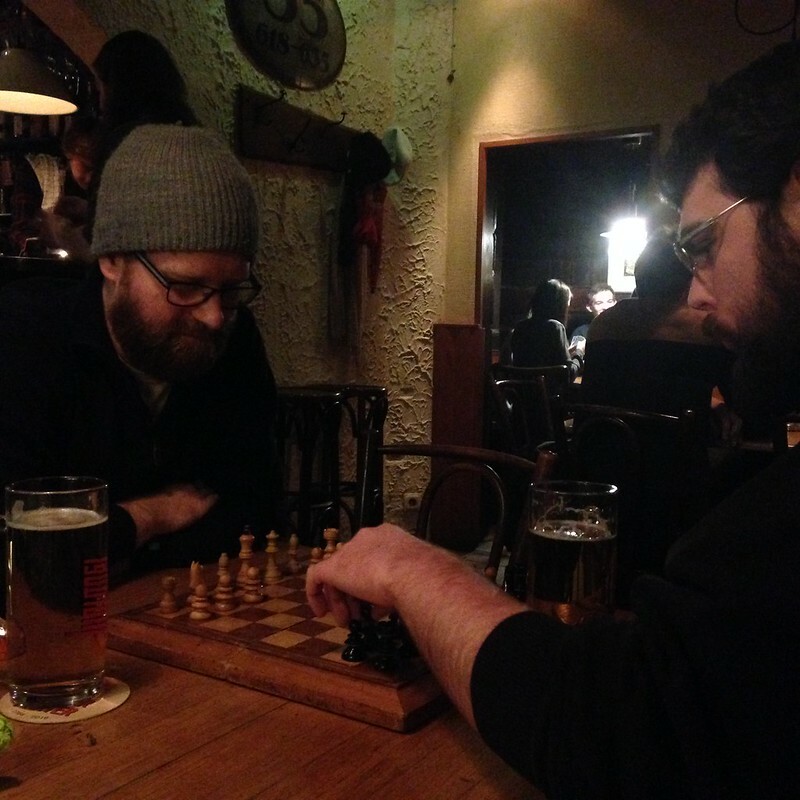 We decided to do some sitting in several of Vienna’s cafes — including Matt’s favorite, Cafe Benno, a “spielbar” where you can play cards or board games. Fun fact: It’s harder than you think to make English words using German Scrabble tiles. Matt taught Paul a thing or two. We also visited a few of Vienna’s more elegant dining rooms so Paul could sample a range of Viennese cakes and pastries. 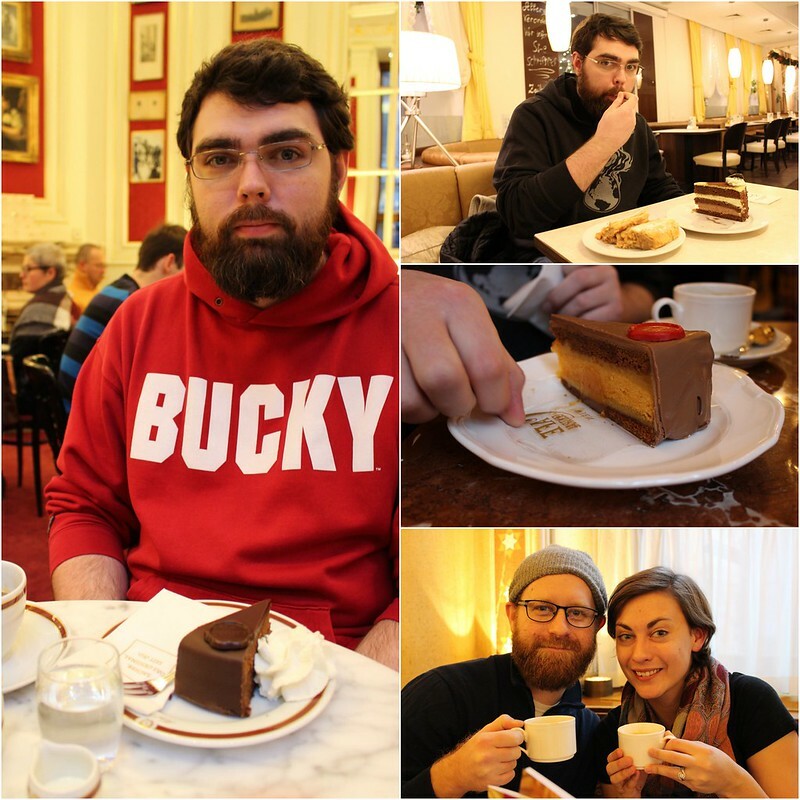 We braved the line outside of Hotel Sacher for a slice of “official” chocolate cake and tried other frilly desserts at Cafe Central and Hubler, our neighborhood konditorei (cake cafe). Left: Bucky at Hotel Sacher. From top right: apple streudal and “mozart cake” at the neighborhood cafe; orange and chocolate cream at Cafe Central; Matt and I figured Paul couldn’t eat EVERYTHING by himself, so we helped. After dessert comes … dinner. 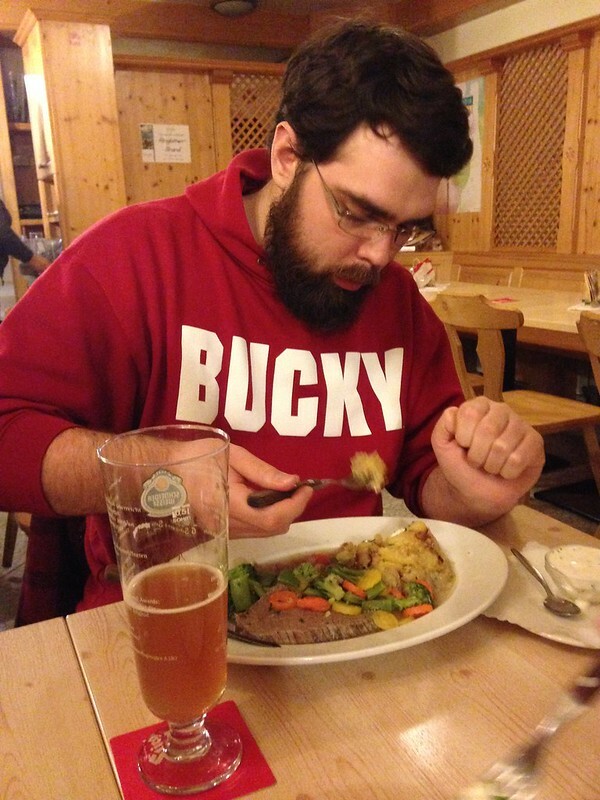 Paul didn’t exactly turn into a vegetarian while in Vienna. Meat! 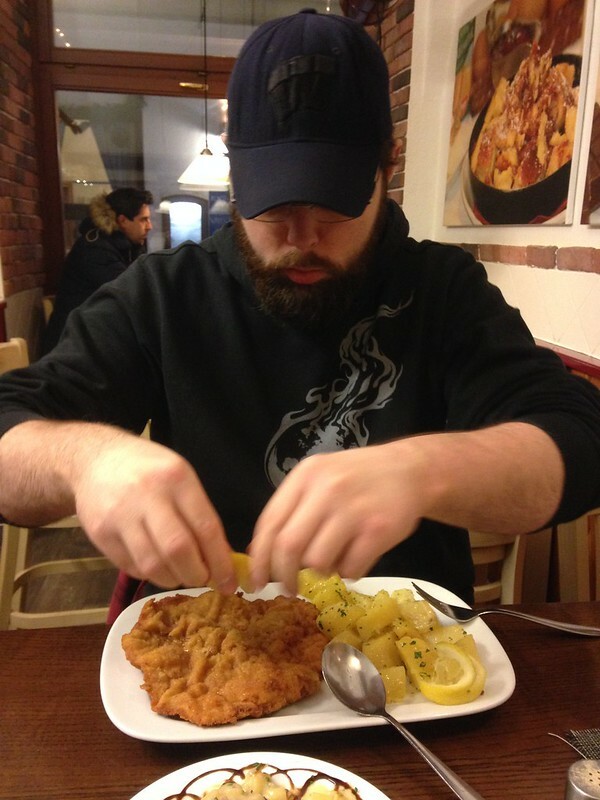 Paul’s first wiener schnitzel at Heindls Schmarren & Palatschinkenkuchl. More meat! 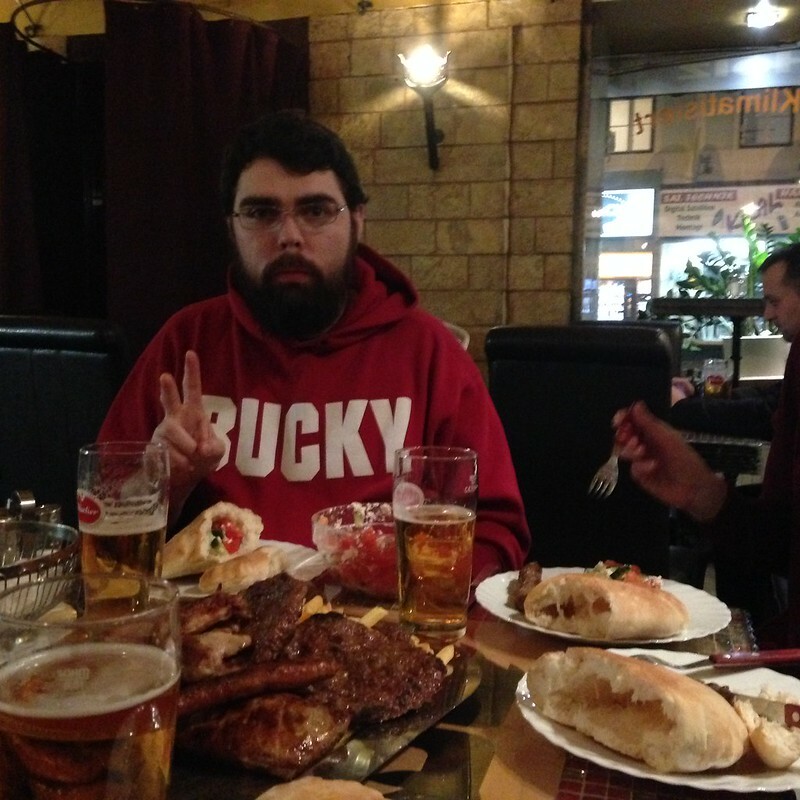 “The platter” at Balkanika, a Serbian grill. There were five of us, and we still had leftovers. EVEN MORE meat! Boiled beef at Zum Lercherl von Hernals, a traditional gasthaus. All that eating meant we couldn’t slack off entirely on our workouts. We went back to the Rathaus for an afternoon of ice skating — and of dodging speedy kids wearing sharp blades. During Paul’s first week, we visited the Wien Museum, which offers a little bit of everything, from Vienna’s Roman-outpost origins through the 20th-century Secessionist art movement. That stop helped us to identify the topic Paul is most interested in: military history. So we spent our last major sightseeing day at the low-key Heeresgeschichtliches Museum, which is decidedly off the normal tourist path. 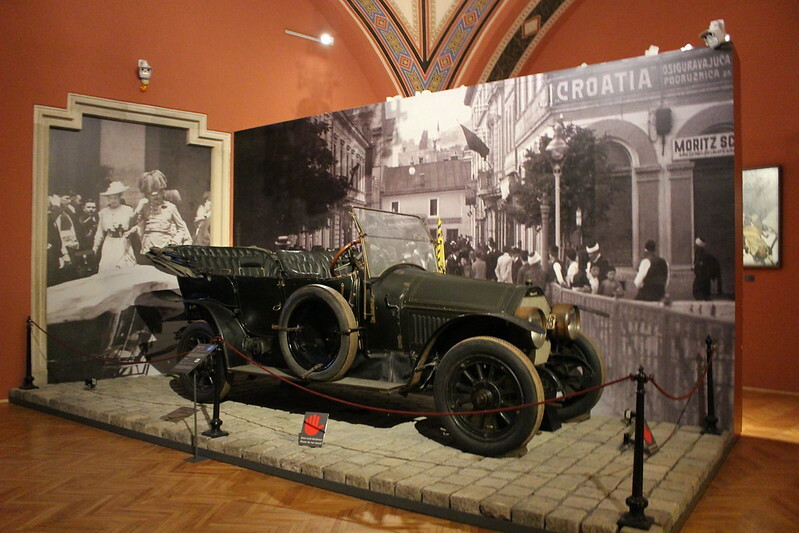 This underrated museum is particularly focused on WWI, and it houses the car in which Archduke Franz Ferdinand was assassinated — the event that sparked the chain reaction to war. 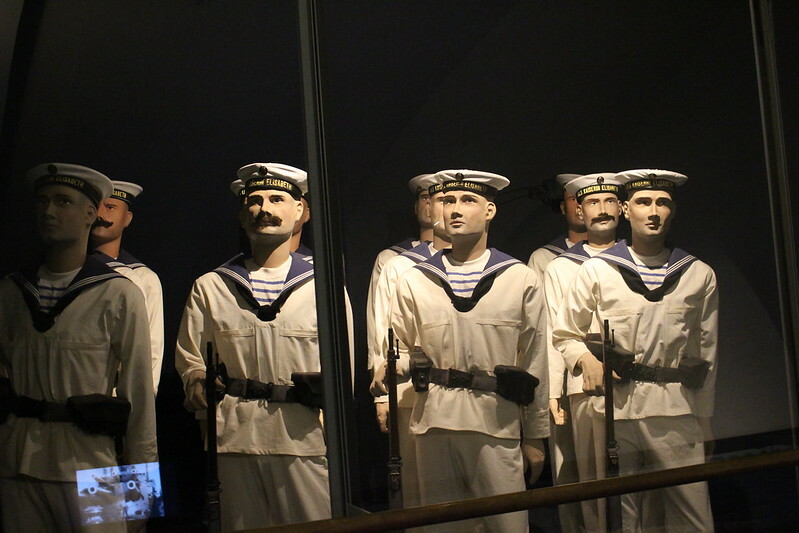 The museum also offers an exhibit about Austria’s short naval history. (Paul’s a Navy vet.) Notice the ship name on the uniform caps: SMS Kaiserin Elisabeth. SISI STRIKES AGAIN. 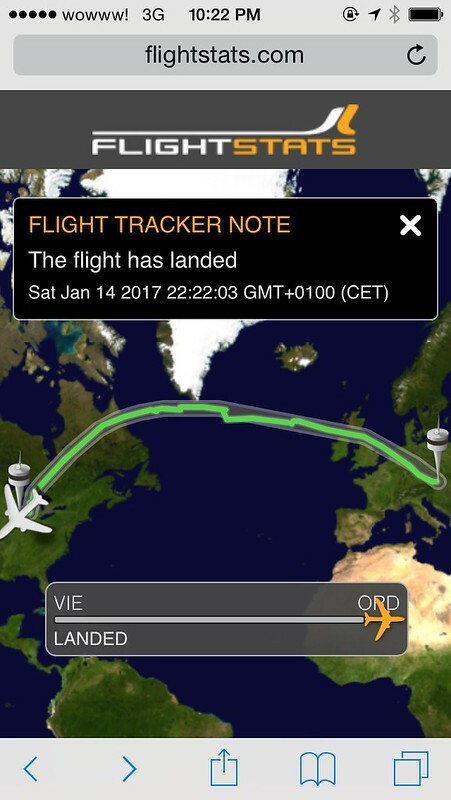 On Saturday, we woke up before dawn to get Paul to the airport in time for his cushy direct flight from Vienna to Chicago. 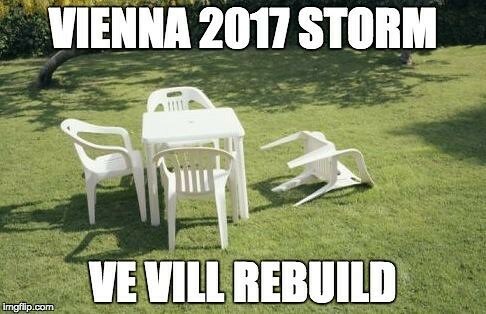 And just like that, the Austrian winter is already a little bit colder. Nice. Very nice. 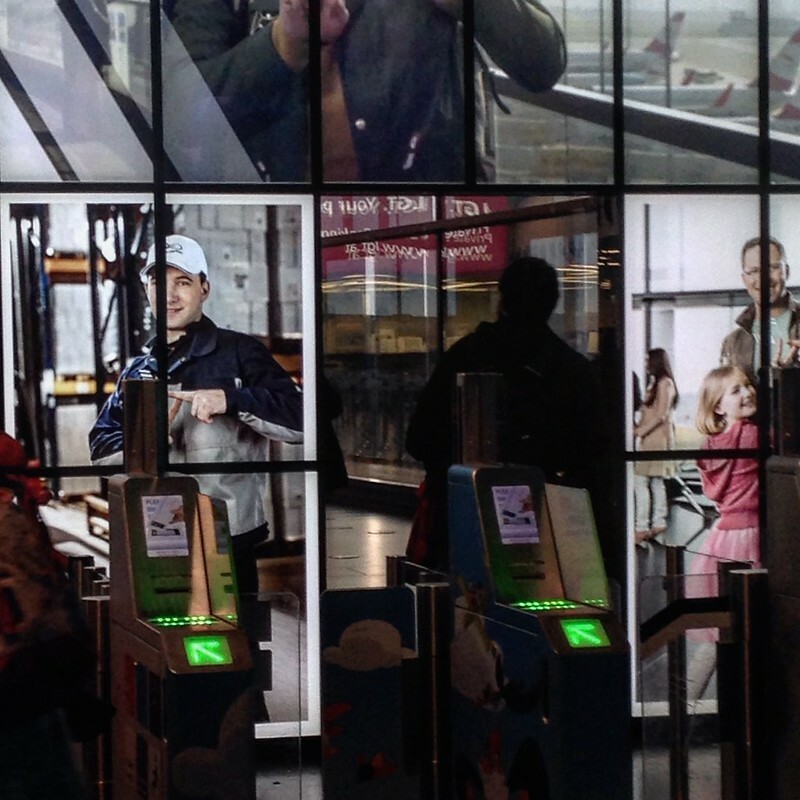 Look forward to the Prague adventure. What an interesting ice skating “maze”. It is a change from the typical rink.